A night out at bingo is an awesome way to spend an evening. Its a low-risk gamble that is more of a social outing than anything else and now, you can enjoy that experience right on your phone! BingoDab is available on all Android devices running 4.0 and higher and is free to download at any time. With BingoDab you can enjoy the real-time dabbing experience of real bingo along with a realistic announcer, authentic dabbing and real people playing real games. Playing happens in real-time with other people so it might take several seconds to find and set up a game. Just like in good ol’ bingo, the announcer will declare a number and its up to you to mark it on your cards. With BingoDab is exactly the same. If you fail to call out bingo before someone else, you’ll end up kicking yourself because you could have won. On the flip side, if you manage to optimistically dab the entire board and call a false bingo, the computer will analyze your board and reject your call. So don’t waste your time trying to cheat. Keep in mind that it isn’t real money you’re playing for so make sure your expectation take that into account. 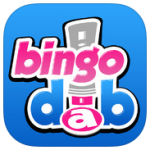 BingoDab is really an excellent bingo simulator for any mobile device. The gameplay is simply outstanding and couldn’t be better in my opinion. Many bingo alternatives don’t incorporate real-time games with players which makes the bingo predictable and boring. With BingoDab, however, you play with real people so you’ll always be on your toes trying to win the next game. If you like bingo in real life, this is the app to get, although you can also check out this site for legendary weekly competitions. Check out BingoDab for Android on the Google Play Store!